Lively and upbeat songs loved by children – and their parents, including the zany “Friends Sleepin’ Over Tonight” and “Slimy Mud,” rock-oriented “Be Yourself” and “Ride My Bicycle,” plus traditional favorites. "Magical Music Express shows a great understanding of children - the way they learn, the way they think, and the way they feel." Pam Donkin and Greta Pedersen are award-winning recording artists, songwriters, and performers. Their music is licensed to Scholastic Books and numerous video projects, and enjoyed in homes, cars, and classrooms across the US, Canada, and beyond. Top-notch musicians complement the recording, headed by Grammy winning guitarist Mark Hanson. A great gift for your favorite teacher! My family loves this CD! My family loves this CD! We especially like the robot on the song Oo Ee, it's so much fun! The recording is so well done. We also love their other CD Friendship Stew. We play both CD's all the time, in the car. I bought this for my grandchildren. 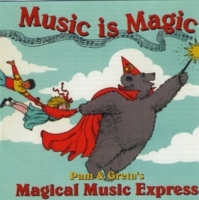 I remember having the original Magical Music Express cassettes for my children and now I am buying the CD for my grandchildren! My children loved this music and now their children will as well!